You can memorize Scripture each week this year by following this blog! Join me as we grow in Christ together. We're starting with something easy.Remember to review this verse every day this week until you can recite it without assistance. 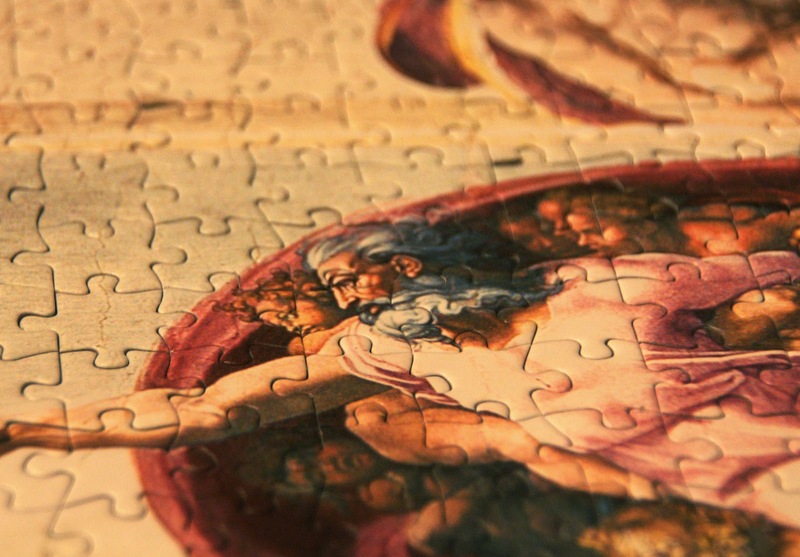 The mystery of God often seems like an unsolvable puzzle. Some may be able to understand more than others, but we all reach a point where we must exercise faith to come to him. This, our first Power Verse, tells us much about God and his nature. This first phrase in Genesis already sets the Hebrew Scriptures apart from everyone else. While other creation stories start with something material already in existence, the Bible states what science finally came to believe during the 20th Century: All things, time, space and matter, had a beginning. There are variations on the theory, but most scientists today also believe that this physical universe will have an end. This again agrees with Scripture, although we look for a new heavens and a new earth, a transformation of everything. Whether one goes from here to literal 6 day creation, or poetic symbolism, the fact remains, the Bible gets it right from the start. God existed before the beginning. Sounds strange, like asking what was God doing before he created time? It seems as though he would have no time in which to do anything if he hadn't yet created it. One of the biggest objections to an infinite creator is his complexity. Philosopher David Hume argued that a being able to create such a complex universe would need to be at least as complex. This puts us back where we started, because now we have to explain God's complexity. Keith Ward answers this objection to the divine with elegant simplicity. God is simply infinite mind from which all material things exist. I've tried to describe God as, infinity with a personality. Universities have struggled, using the language of mathematics and science, to explain infinity. I don't think one blog entry is going to solve the mystery. This requires faith. I don't understand how God exists, but I believe it. "Created" isn't hard for the thinking mind to accept. At this point in history almost everyone believes that the physical universe came into existence from something other than itself. The question is what caused creation? Some believe that quantum fluctuations in a vacuum caused matter and antimatter to spring from nothing... something like that. Others believe that the intricate design of everything points back to that infinite mind. I'm with that camp! If we all agree in something from nothing, and the something has design, doesn't a Designer make more sense than not? Everything! Some of God's attributes we can conclude from observing his creation. For others we'll need to get into his Word. Let's do that together this year! Image from Flickr user "nauright" common license.